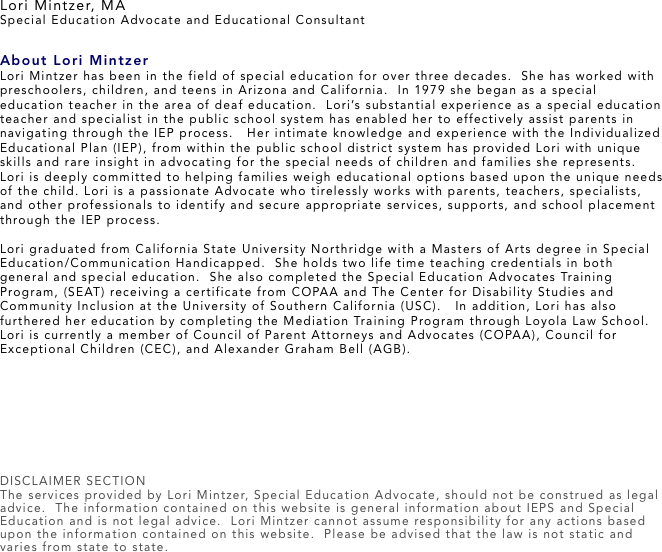 Lori Mintzer has been in the field of special education for over three decades. She has worked with preschoolers, children, and teens in Arizona and California. In 1979 she began as a special education teacher in the area of deaf education. Lori’s substantial experience as a special education teacher and specialist in the public school system has enabled her to effectively assist parents in navigating through the IEP process. Her intimate knowledge and experience with the Individualized Educational Plan (IEP), from within the public school district system has provided Lori with unique skills and rare insight in advocating for the special needs of children and families she represents. Lori is deeply committed to helping families weigh educational options based upon the unique needs of the child. Lori is a passionate Advocate who tirelessly works with parents, teachers, specialists, and other professionals to identify and secure appropriate services, supports, and school placement through the IEP process. Lori graduated from California State University Northridge with a Masters of Arts degree in Special Education/Communication Handicapped. She holds two life time teaching credentials in both general and special education. She also completed the Special Education Advocates Training Program, (SEAT) receiving a certificate from COPAA and The Center for Disability Studies and Community Inclusion at the University of Southern California (USC). In addition, Lori has also furthered her education by completing the Mediation Training Program through Loyola Law School. Lori is currently a member of Council of Parent Attorneys and Advocates (COPAA), Council for Exceptional Children (CEC), and Alexander Graham Bell (AGB).